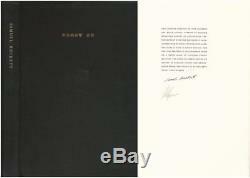 Nohow On by Samuel Beckett Signed Limited Editions Club 1989. The Limited Editions Club; city not noted, 1989. Book is limited to 550 numbered copies. This book is number 295. Signed by Samuel Beckett and Robert Ryman directly on limitation page in rear. A nice, clean and unmarked copy. 9.5 x 12 inches, 128pp. LEC prospectus laid-in, tissue protected etchings. The picture on the listing page is of the actual book for sale. Additional Scan(s) are available for any item, please inquire. We grade Fine, Near Fine, Very Good, Good, Fair. Any faults are always noted including remainder marks, price clipped dust jackets, and previous owner markings. If not noted then they do not exist on this book. The item "Nohow On by Samuel Beckett Signed Limited Editions Club 1989" is in sale since Wednesday, January 2, 2019. This item is in the category "Books\Antiquarian & Collectible". The seller is "lavendierbooks" and is located in Scenic N Scituate RI. This item can be shipped to United States.